Hundreds of guest all dressed in white for the occasion sat down in Cathedral Square in Vilnius for the annual 'White Dinner'. Meanwhile in front of the old Town Hall a select group was enjoying dinner 50 meters up in the sky. 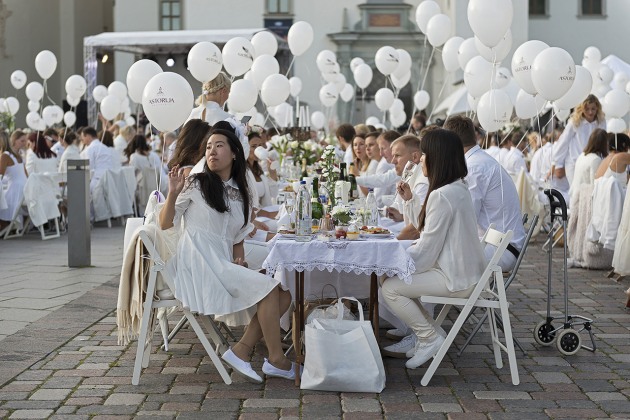 Little could beat the touch of class of the White Dinner experience in front of the White Palace of the Grand Dukes of Lithuania (Valdovų rūmai). A partially dramatic sky provided the right background. Festive white balloons, a white swing, entertainers on stilts it was all part of a unique experience in a historic setting at this annual event. The weather was a bit on the cool side this year, but it was not raining. 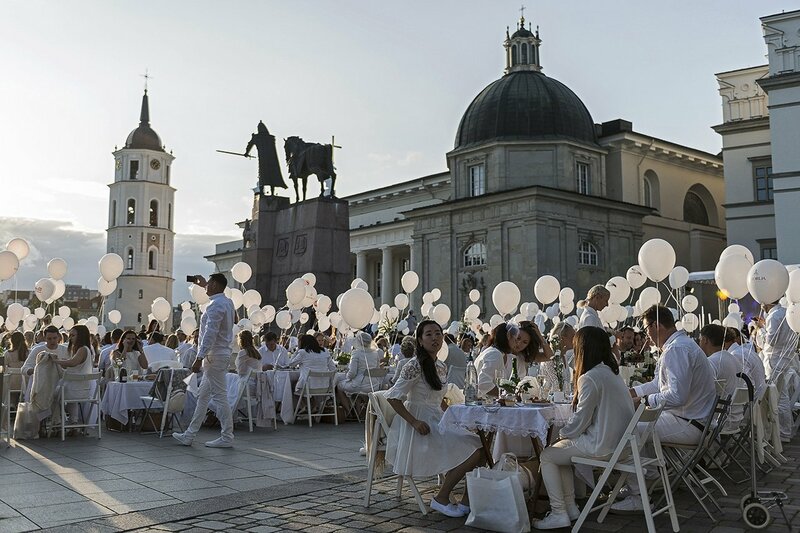 Nothing contrast more with the dinner experience in front of the old Town Hall (Vilniaus rotušė) were 22 were sitting 50 meters up in sky dining on a four-course dinner. After being hosted up by a team of Lithuanian crane operators, a selection of Nordic food was served. All of the food being prepared by Chef Rando Volkov of Estonia's Prengly Island restaurant. Those sky diners had to dress a bit warmer than those of Cathedral Square did, as it was a bit of a chilly evening to enjoy the dinner with a view. The organisers had several formulas for those that wanted a meal and a drink, slightly out of the ordinary. They promised to back next year.